ROWLEY - She had the analytical chemistry degree and years of working in industry. He was a contractor who made wine in his basement. They started dating, and realized they made a pretty good blend. 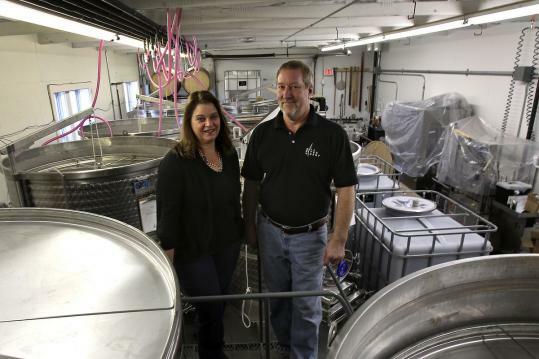 The Mill River Winery, at the corner of Route 1 and Wethersfield Street is already a large wine-making operation, but a portion of the 3-plus acres will soon be planted with grapevines. And the heart of the operation is the partnership of Rick Rousseau and Donna Martin. They met when he did some painting at her house. Martin had been a corporate chemist, mainly for area medical device firms, but had dialed back her career to raise her two kids. Rousseau had already won awards for his homemade wines, made from purchased grapes, when they started dating in 2006. “I ended up building her a lab in my basement,’’ said Rousseau, who lives in Rowley. “Instead of making a heart angioplasty catheter, I was making the best wine I could,’’ said Martin, of Wenham. With her kids growing up, she was ready for a new challenge, but diving back into a life of 60-hour weeks and a Route 128 commute wasn’t it. Both North Shore natives and in their 50s, she and Rousseau started talking about a winery, and a dream took shape. Martin wrote a business plan that was strong enough to interest area banks even in the dark days of 2008. In 2010, they closed on the run-down property that had housed Dodge’s cider mill and ice cream stand. Much of the main building had to be rebuilt, though they saved the beams and reused much of the wood. A newer, cinder-block building out back fit their plans nicely. The main building now houses a stylish shop and tasting room, open for a few months now. (Hours and details at millriverwines.com.) There they sell their Mill River varietals, such as zinfandel and chardonnay, and Plum Island red and white blends, by the bottle or in flights of five one-ounce tastes. Tucked away in the kitchen are a couple of empty old Dodge’s Sweet Cider bottles brought in by a local customer. The rear building is now filled to the corners with stainless-steel wine tanks that hold up to 1,000 gallons, fat plastic “flex tanks,’’ and French oak barrels, plus gleaming new machines for bottling and labeling the wines. With the network of coolant hoses that allow precise temperature control of the wine, “it reminds me of that old movie ‘Coma,’ ’’ Martin said. Rousseau’s specialties are wine-making and building. Martin provided the focus to push through the countless regulatory hurdles facing a business that makes and sells an alcoholic beverage. She also brings scientific rigor to the wine-making process. The winery is named for a small river nearby that crosses under Route 1 and empties into the great marsh. The Mill River label features a red-winged blackbird clinging to a cattail. Martin explains that several components of the design have symbolic value from Native American lore or numerology, indicating hard work that leads to good fortune. As for the wines themselves, Rousseau says the couple and their few part-time employees are not trying to do anything fancy or artificial. He is particularly proud of the zinfandel, made from grapes out of Lodi, Calif. The vines they will plant on the site in the spring will produce Frontenac grapes for red wine and Cayuga for white, but it will be at least three years before the vines produce commercial quantities of grapes, Martin said. They hope to get earlier production from apple trees they’re planting to make cider and hard cider. They hope that before long they will max out production, using both grown and purchased grapes, at about 5,000 cases of wine a year. There are more than 40 small wineries operating in the state, says Kip Kumler, owner of Turtle Creek Winery in Lincoln and chairman of the Massachusetts Farm Wineries and Growers Association. Mill River is an example of new members “doing very exciting things’’ to capitalize on the growing popularity of wine, the local food movement, and recent regulatory changes. “Massachusetts doesn’t count as very much in terms of agriculture, in comparison with places like Nebraska or Montana or Iowa,’’ said Kumler. “But Massachusetts is in the top three or four states - and the envy of the rest of the country - with respect to the sale of agricultural products directly to the consumer from the producer. “The farm stands, the family vineyards, the innovations that have taken place since the 1970s, where increasingly people have done things to try to improve their own economic viability by selling directly to the consumer, have in many respects been pioneered in Massachusetts,’’ he said. Kumler says the winery can have multiple benefits for the community, including bringing in tax revenue, encouraging tourism, and preserving agricultural land that might otherwise be developed for housing. Among the ideas in play to attract tourists and foodies alike, Martin said, is a North Shore “wine trail’’ that would link Mill River with Alfalfa Farm Winery in Topsfield, Russell Orchards in Ipswich, and Willow Spring Vineyards in Haverhill.